Today is the official publication day of my latest book, Land of Fish and Rice: Recipes from the Culinary Heart of China! It’s a collection of recipes and stories from the Lower Yangtze Region, Jiangnan in Chinese, which encompasses modern Shanghai and the inland provinces of Zhejiang and Jiangsu. This wonderful region has been known since ancient times as a ‘Land of Fish and Rice’. For centuries, local cooks have been using the plentiful produce of its lakes, rivers, fields and mountains, combined with delicious flavourings such as rice wine, vinegar, soy sauce, spring onion and ginger, to create a cuisine that is renowned in China for its delicacy and beauty. In many ways, the food of this region is THE Chinese cuisine, regarded by gourmets as the most exquisite regional style and celebrated by poets through the ages. If Sichuanese cuisine is the jazz of the Chinese food world, Jiangnan food is its classical music. In the West, however, the food of Jiangnan is perhaps the least known of the so-called ‘Four Great Cuisines’ of China; while Cantonese food is famed the world over and Sichuanese has started to captivate palates worldwide, it has languished in the shadows. As readers of my travel memoir Shark’s Fin and Sichuan Pepper may remember, I first started to fall for it during a trip to the ancient gastronomic capital of Yangzhou in 2006. Since then, I have found it hard to tear myself away. I have returned again and again to Yangzhou and the modern culinary centre of Hangzhou, with its lovely West Lake, to learn to cook local dishes and research the food culture. I’ve become addicted to the funky fermented tastes of Shaoxing and the delicate seafood of Ningbo, and have savoured the cooking of Shanghai, which has become a melting pot of flavours from all over the region. I have also made many friends there, and have been privileged to study in the kitchens of celebrated restaurants. 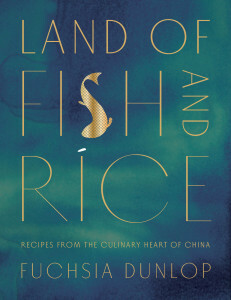 Land of Fish and Rice includes many classic recipes from the region, including Dongpo pork, West Lake fish in vinegar sauce, Mrs Song’s fish soup, Lion’s Head meatballs and Shanghai potsticker buns, Within its pages you’ll find simple supper dishes, healthy vegetables and some spectacular centrepieces, such as Beggar’s chicken in its shell of ‘mud’ that has to be smashed open with a mallet at the table! It would be impossible to do justice to the rich and extraordinary cuisine of this ancient region in a single book, but I hope that Land of Fish and Rice will help to put it on the map!